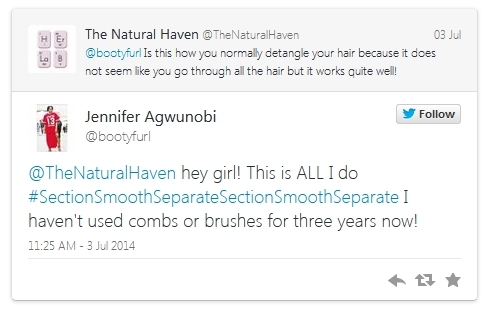 THE NATURAL HAVEN: 4c Hair: How much detangling do you really need to do? 4c Hair: How much detangling do you really need to do? If you have 4c hair and have chosen a exclusive dry finger detangling method, you will know that it is very easy to end up spending hours on your hair. I was therefore intrigued when I found this video of the Long 4c Case Study alumni Jennifer and I had to verify if this level of detangling is all she does. So would you try the short approach or would you be worried that your hair may end up matted? I think I actually adopted Jennifer's approach. So far, I'm on my second week using it and it seems to be going well. I think what's helping me is that I am still transitioning, and my hair is not yet as long as hers. Oh good to know it works for you too! I love your blog you always have such great info! I find that if I detangle with my hair stretched then Jennifer's method works well. If my hair is in a shrunken state a more elaborate approach is required. Thank you for the support :) I do agree with you, that the method does probably work best for hair that is maintained in a stretched state. Ps: I have the tightest, driest, kinkiest, most shrinkage and matting-prone hair known to man. Everyone I know admits it a friends, strangers, hairdressers. 4zzzzzzzzz and finger combing sill worked. Thank you Jennifer, that is so sweet of you! It is a full circle moment when you now become the teacher! Amazing! I don't finger detangle. My hair tangles and knots easily so I've been very skeptical. I also think it would take too much time to get a thorough detangle on my hair. I wouldn't consider Jennifer's video as a detangling session since the hair is stretched and doesn't seem to be tangled to begin with. I hope that I am not devaluing the method bc I do think its helpful esp when switching from one style to the next on stretched hair. I actually do this often, but in my mind never considered it as detangling to the full extent. I typically detangle my hair when it is freshly washed, shrunken, and tangled but haven't seen any finger detangling videos on such hair. Should hair be detangled only in the stretched, oiled state? Should I not be detangling when I do? You are not devaluing the method. I asked Jenifer the question for the same reason, it just didn't look like much was being done. She does have hip-length hair and does keep her hair mostly stretched and this is her detangling method. I think you have to detangle as it suits you as long as you are not getting too much breakage. I tend not to let my hair shrink because I do not wash it free, always in loose braids or twists. I found that letting it shrink all the way is a prompt for tangling. This is why many people avoid this state. If it works for you, there is no reason to change it. Also, not combing gives me complex knots. Broken strands wrap themselves along other strands, and it drives me nuts. I had to adopt the finger detangling method when my hair got too long to comb, I didn;t event know there was a name for it. I have combination hair which grows SOO slow and breaks easily, so finger detangling allows me to keep as much hair as possible on my head and less on the floor. My hair is in twists 75% of the time and twist outs and updo and other coily haired friendly most of the time. so a full 100% detangled hair is unnecessary. I wish there was a LIKE button for Jennifer's comment. You are truly awesome Jc. btw, when is the next issue of the magazine coming out?